On 15 August 1945, Japan’s surrender brings World War II to a close. News doesn’t come much more momentous than that, and one of the broadcasters reporting it was KFWB, a Los Angeles radio station. 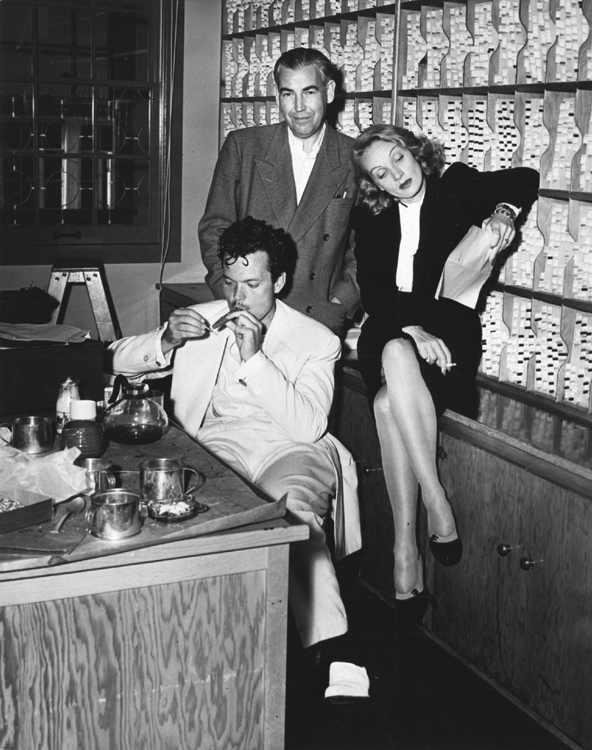 In the studio were none other than Hollywood stars Rita Hayworth, Orson Welles and Marlene Dietrich. Orson and Rita had been married for two years. Judging by their expressions here, who would guess that disaster lay ahead? The following year they would begin making The Lady from Shanghai, with Rita in the starring role opposite Orson, who also directed. It ‘reads’ like a letter of pure hatred towards Rita and it was released in 1948, the couple were divorced in November 1947. Marlene had moved from Germany to the US in 1930. She had rejected the Nazis’ blandishments and become one of the first celebrities to raise money for US war bonds. The photos are from the personal collection of John Dehner. John worked as a radio actor before becoming a TV star. Prior to acting, he was an animator at Walt Disney Studios and also a professional pianist. Also featured are Sam Balter, a member of the United States gold medal basketball team in 1936 and the only Jewish-American to win a gold medal at the Berlin Olympics; John B Hughes, an actor, who starred in Meet John Doe (1941) and Rhapsody in Blue (1945); and Lou Marcelle, an actor, known for Stars on Horseback (1943) and Where Will You Hide? (1948). KFWB Radio, Los Angeles, 2 September 1945. 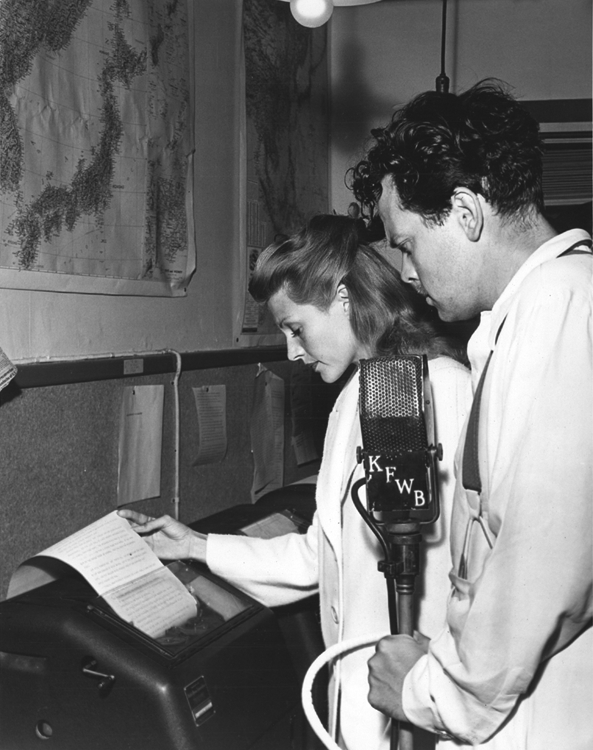 Orson Welles looks on as Rita Hayworth reads the teletype announcing Japan's surrender. Photo by Otto Rothschild. KFWB Radio, Los Angeles, 2 September 1945. 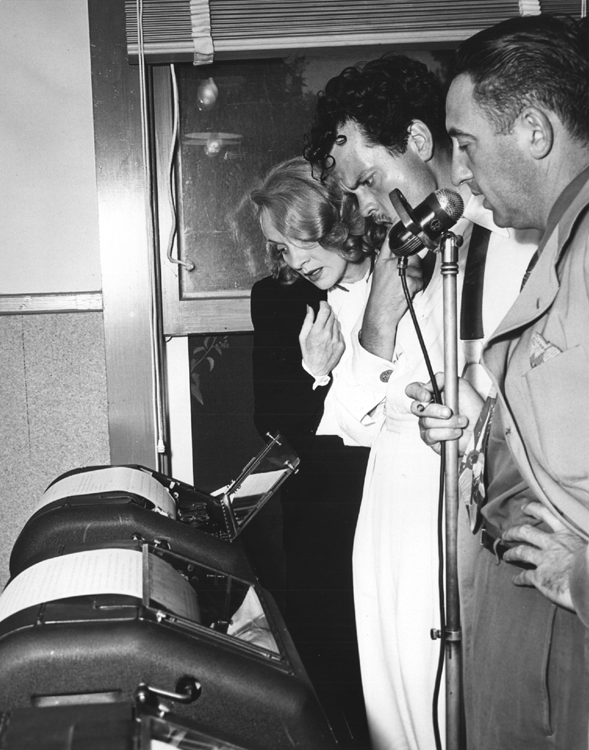 Marlene Dietrich, Orson Welles and Sam Balter are mesmerized by the teletype machine announcing Japan's surrender. Photo by Otto Rothschild. KFWB Radio, Los Angeles, 2 September 1945. 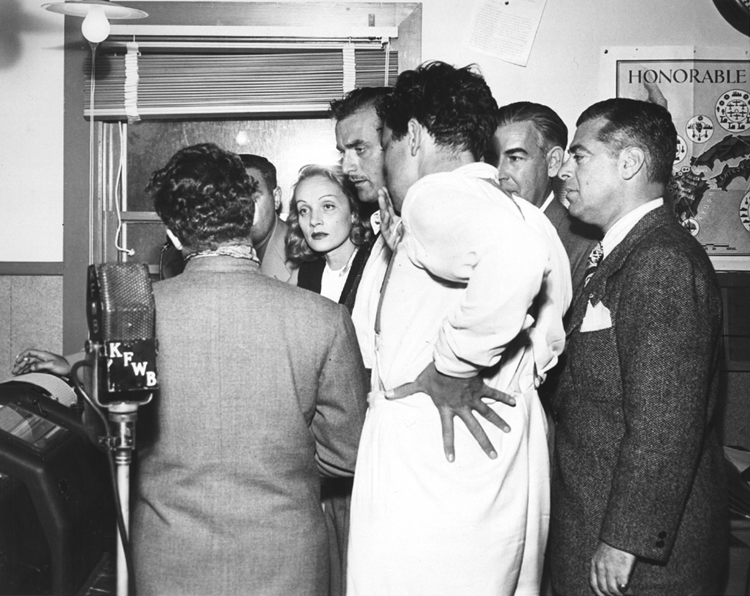 Marlene Dietrich, Orson Welles, Sam Balter and others are mesmerized by the teletype machine announcing Japan's surrender. Photo by Otto Rothschild. KFWB Radio, Los Angeles, 2 September 1945. 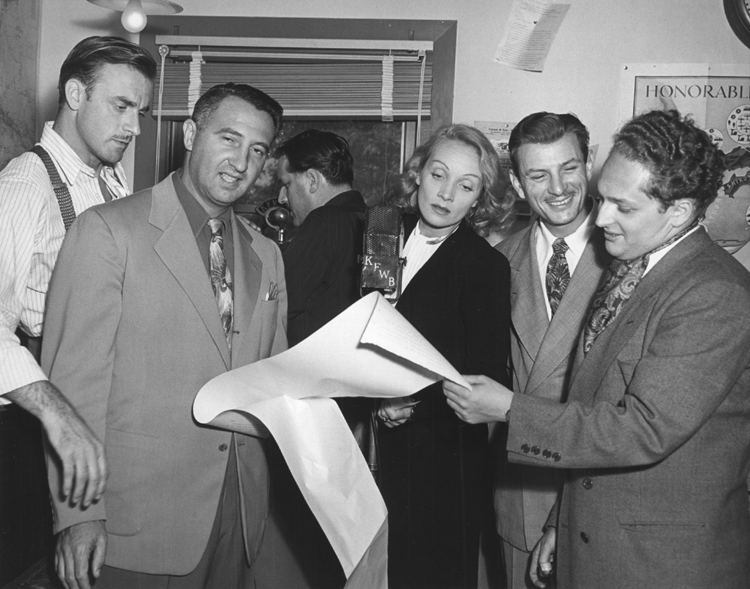 Marlene Dietrich receives news of Japan's surrender together with John Dehner, Sam Balter, John Hughes and Lou Marcelle. Photo by Otto Rothschild. KFWB Radio, Los Angeles, 2 September 1945. 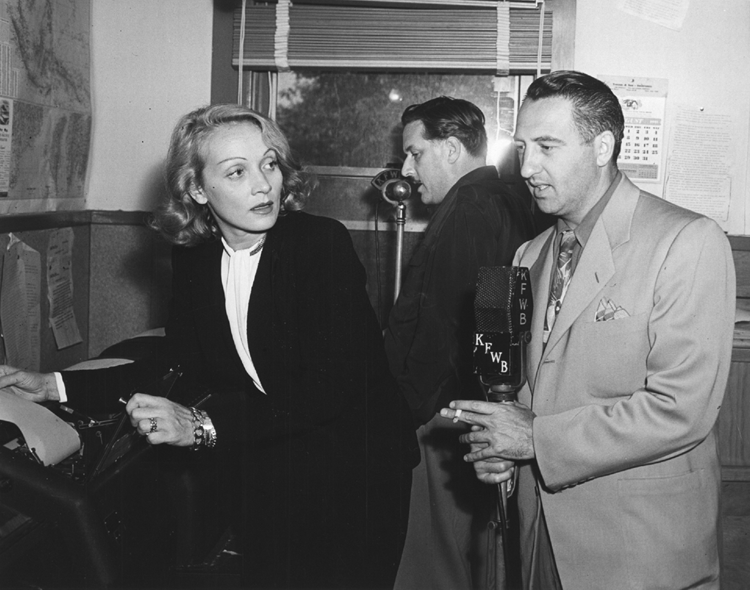 Marlene Dietrich and Sam Balter discuss the news of Japan's surrender. In the background is John B Hughes. Photo by Otto Rothschild. KFWB Radio, Los Angeles, 2 September 1945. Marlene Dietrich, Orson Welles, John Dehner and a crowd of men gather around a teletype machine as news arrives of Japan's surrender. Photo by Otto Rothschild. KFWB Radio, Los Angeles, 2 September 1945. 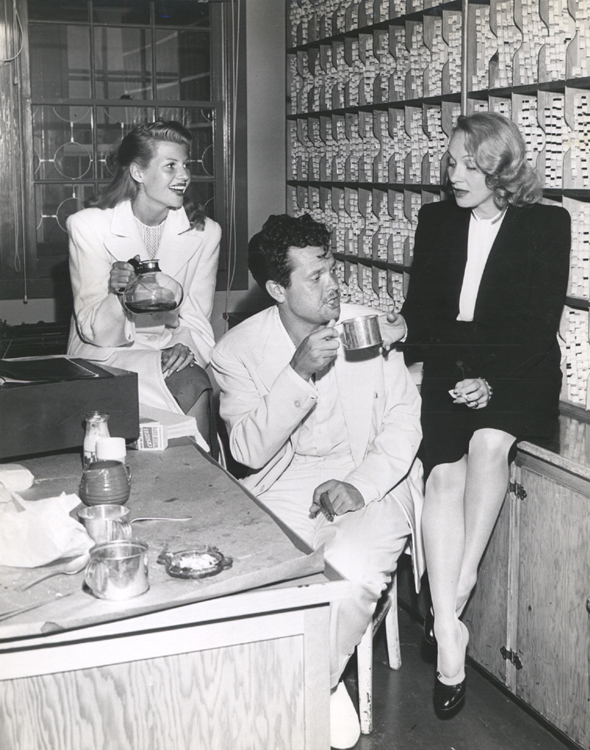 Rita Hayworth, Orson Welles and Marlene Dietrich relax after announcing the surrender of Japan. Photo by Otto Rothschild. KFWB Radio, Los Angeles, 2 September 1945. 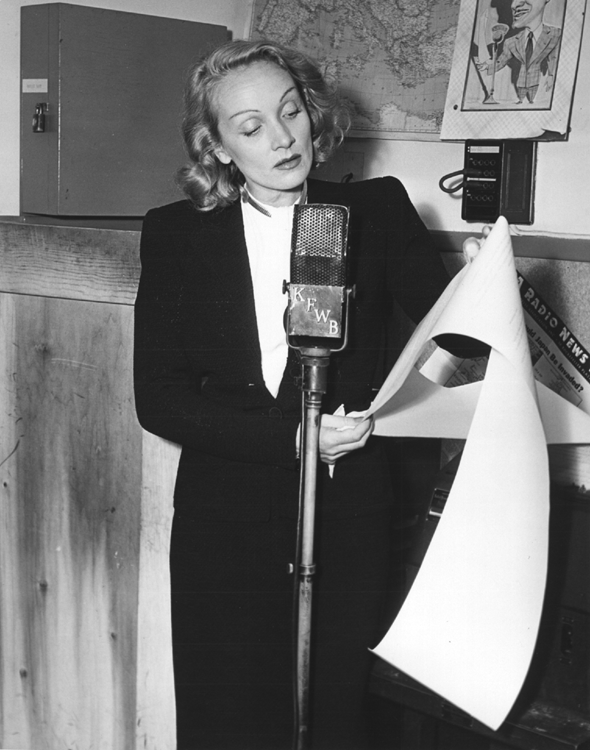 Marlene Dietrich announces Japan's surrender. Photo by Otto Rothschild. KFWB Radio, Los Angeles, 2 September 1945. Orson Welles and Marlene Dietrich relax after announcing the surrender of Japan. Photo by Otto Rothschild.